Clyde Radliffe is BACK!! 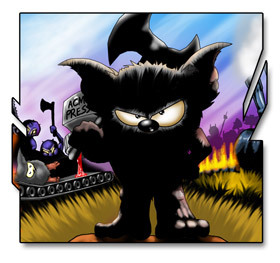 The stunning classic game CREATURES 2 by Apex Computer Productions is now available as budget and premium disk editions, released in 2009 by Psytronik Software in association with www.infinitelives.tv. Clyde Radcliffe is back and his desperate mission is to save his nine kids from the clutches of their torture-happy kidnappers - the demented Demons! Can he prevent them from mashing, frying, chainsawing and melting his beloved Fuzzikins? The original was wacky, zany, cruel and fun - this is mad, bad, frenetic and seriously over the top! · Full-colour disk-sleeve and disk-label! · Incredible graphics and animation! · 6 fiendish torture screens to solve! · Demon encounters, interlude screens, hidden bonus screens, island hopping stages + much more! This game is dedicated to Chaz and the dozens of Stunt-Fuzzies who gave their lives — they will never be forgotten.